SGA 2015 | Geoconferences (WA) Inc. 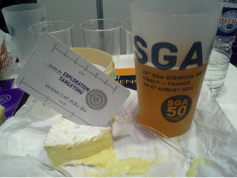 I am very grateful to Geoconferences (WA) Inc. for the JH Lord Travel grant which helped to cover the flights for the 13th SGA Biennial Meeting 2015 (24-27 August) in Nancy, France. The Biennial meeting is a well-known applied geology meetings in the world and it has several multidisciplinary themes on various research topics over the four days of programme. The conference provided an excellent opportunity to gain feedback of my Masters thesis, in preparation for future publication. The conference also allowed me to learn from talks and poster presentations about the recent advances in improving our search for potential mineral deposits. The title of my presentation was originally “Fluid flow and rock permeability considerations for Au mineral systems: inputs from numerical simulations” which I changed to “Crustal Fluid Flow in Mesoarchean Granite-Greenstone Terrane: Example in the East Pilbara Craton”. My talk was placed in Session 3: Fluids and ore genesis. I presented the critical elements of my Masters thesis through the estimation of dynamic permeability and performing a one-way coupling effect of two numerical codes and observe fluid flow patterns at different time-steps of the sagducting greenstone (seen in the evolution of the dome and basin feature found in the East Pilbara Craton). Estimating dynamic permeability was achieved by utilising strain-rate (calculated from Ellipsis) through a linear correlation of a pre-defined background permeability-depth decay function. Fluid flow activity was found to be most active during periods of asymmetrical distribution of strain, which occurs prior to greenstone sagduction. The feedback I got from my colleagues and the geologists I converse with after the presentation was generally positive while encouraging me to pursue a PhD. With the aid from Geoconferences WA, being able to present at an international conference provides a good conclusion to my Masters studies. Again I thank Geoconferences WA for the JH Lord travel grant and helping to promote my research findings on Western Australian geology to the wider international community.